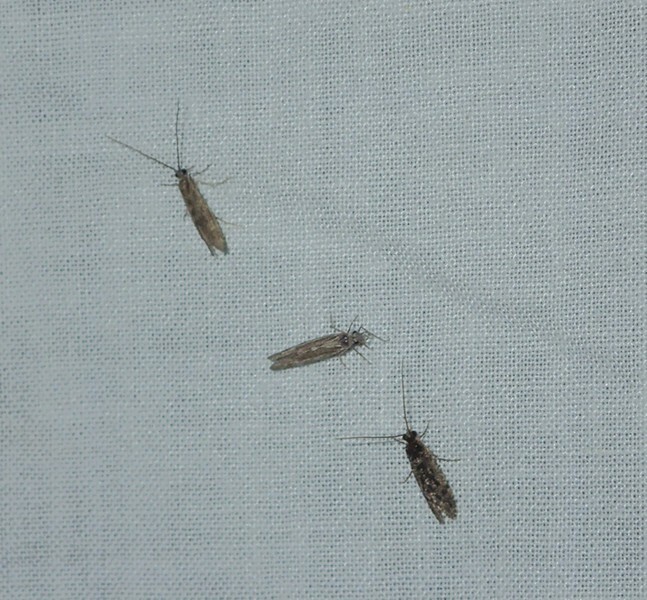 Three small caddisflies land on the light trap. My light trap isn't very sophisticated — just a white bed sheet stretched tentlike over a rope with three black light CFLs and an LED white light. It's powered by an extension cord or a small lawnmower battery and an inverter it can be set up anywhere. During the warmer months of the year, it supplies me with an endless variety of visitors. Lately there have been dozens of little caddisflies (order trichoptera). Attracted to lights, they look like nothing more than small dark gray moths. As alike as they may appear as adults, when they were larvae they were not at all similar. While moths live their early lives as caterpillars feeding on plants and granny's old wool socks, caddisflies lived their early lives underwater building and carrying around their very own camper shells. Caddisfly larva with shelter made of redwood needles. Different species build from different materials, some use pebbles, others sand and one species around here uses old redwood needles laid out neatly along its body. The French artist Hubert Duprat has supplied some with grains of gold and precious stones with which to build opulent cases. 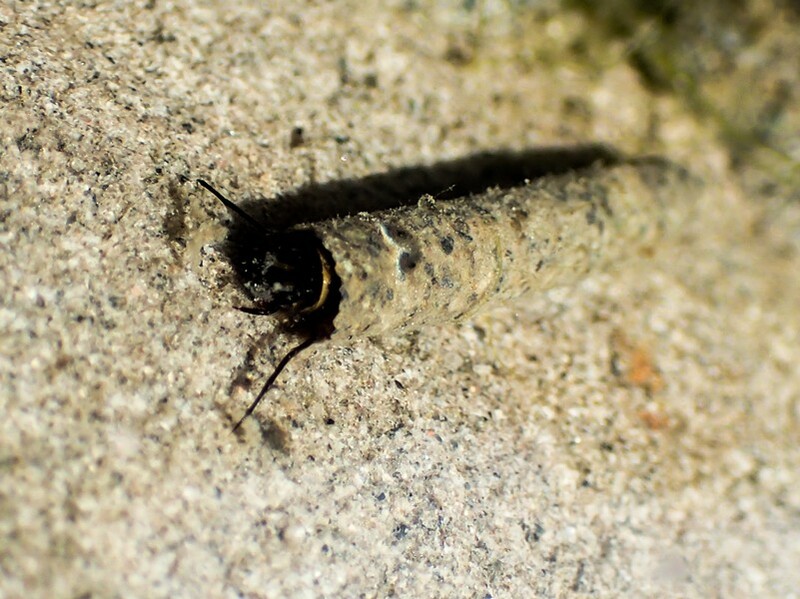 A caddisfly larva its its house of sand. Their diet varies widely from species to species; some scrape algae off of stones, some shred leaves and a few are predators casting a net to catch tiny creatures from the current. The best book I've read on the subject, Caddisflies by Gary LaFontaine, was written for fly fishermen. 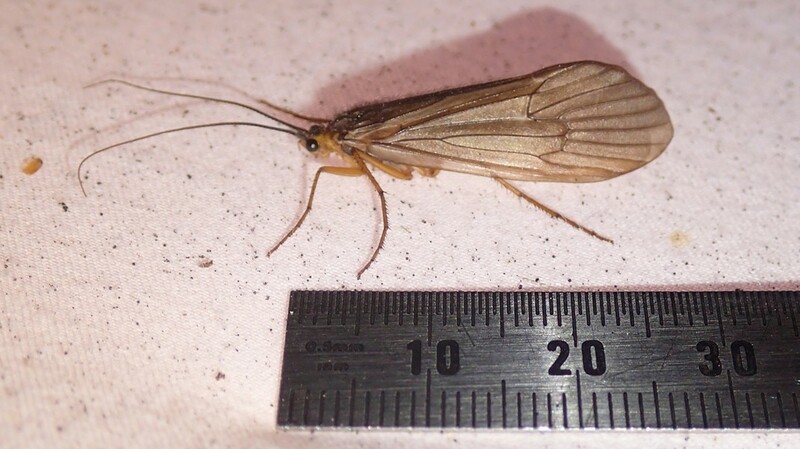 Long under-appreciated as a food source for native fishes, caddisflies are particularly vulnerable when they leave their stone and straw homes on the bottom and rise to the surface where, with any luck, they escape the water and fly away as adults. When they do it in numbers, trout can become particularly finicky and will ignore any other food offered which can frustrate the uninitiated fisherman to no end. It can be explained as a matter of economics: Why waste energy and time pursuing questionable things when restricting one's efforts to a sure thing is efficient? 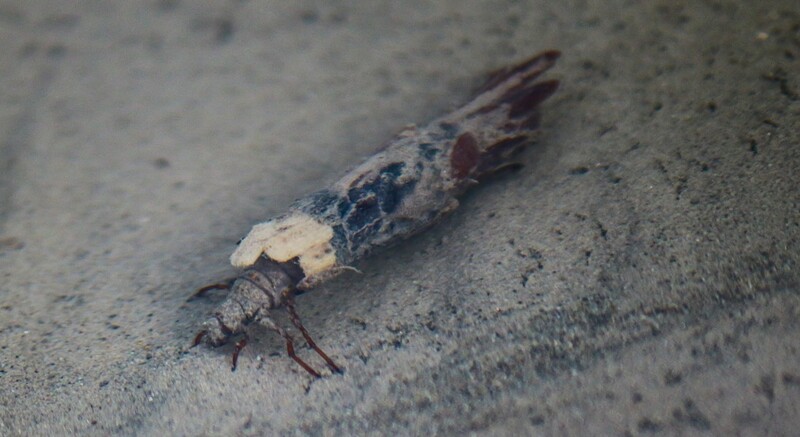 Large caddisfly with plain wings. Last night I was visited by a large specimen and tonight by another large one of a different species. You can tell they're not moths because on close examination caddisfly wings lack the scales of their moth cousins. A large caddisfly from the light trap.